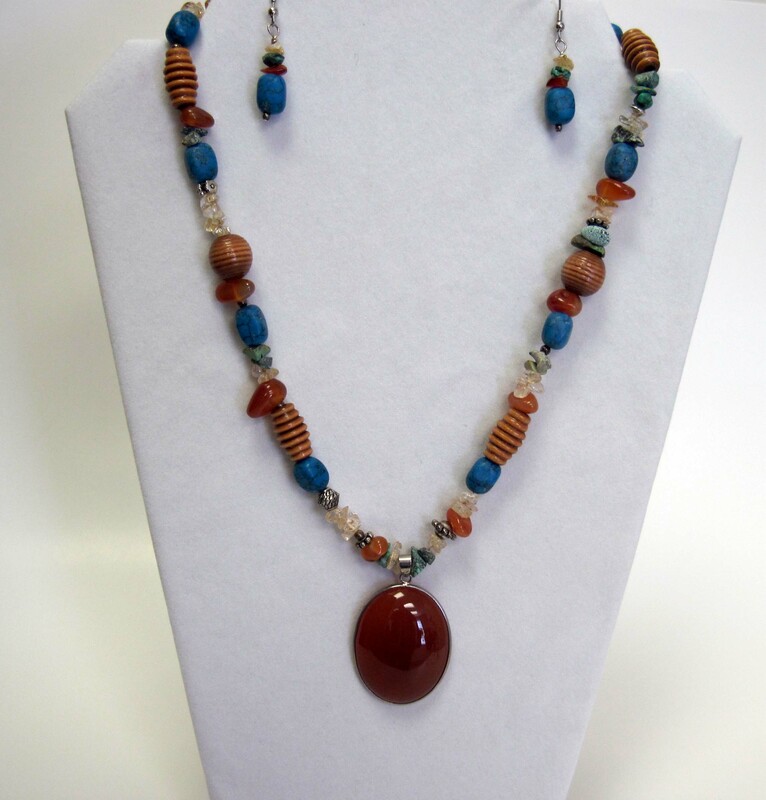 38″ Red Jasper with gold plated chain and coral glass beads. The Jasper is more of a coral color than red. 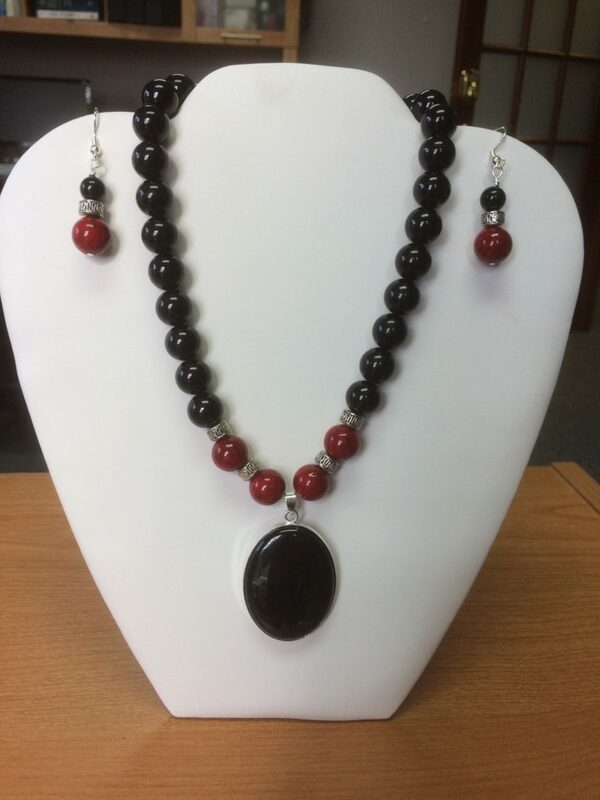 Red Jasper: Physical Strength and Vitality, Stabilization of one’s Energies. Red Jasper enhances one’s endurance and stamina and can over time increase “chi” the vital life force. It strengthens the rook charka and enhances memory. It stabilizes one’s energy leading to good health, balanced emotions and just actions. Red Jasper does it’s work gradually, but the gains become permanent. Helps to release shame or guilt and sexual issues. It can enhance physical exercise and help to recover from physical illnesses. It helps generate muscle tissue. It also supports the circulatory and respiratory systems. 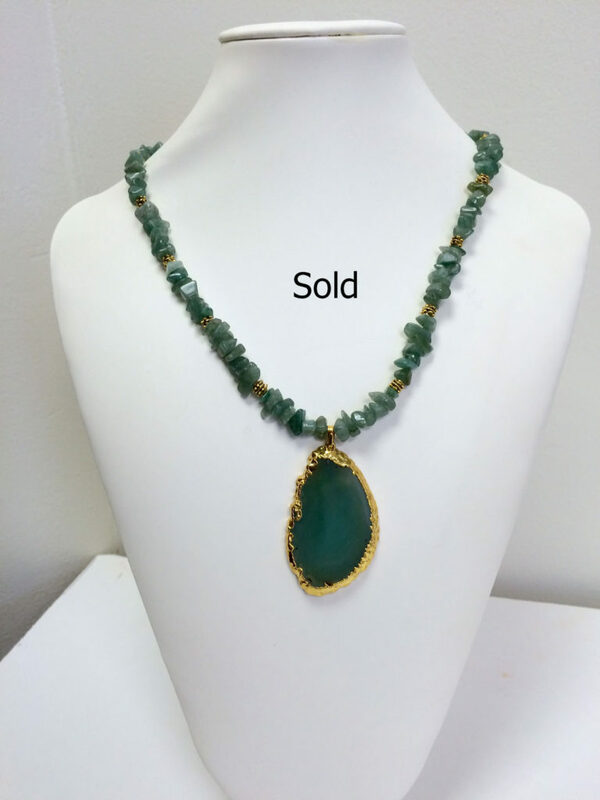 Green Aventurine Chip Necklace with a dyed Agate Drop. 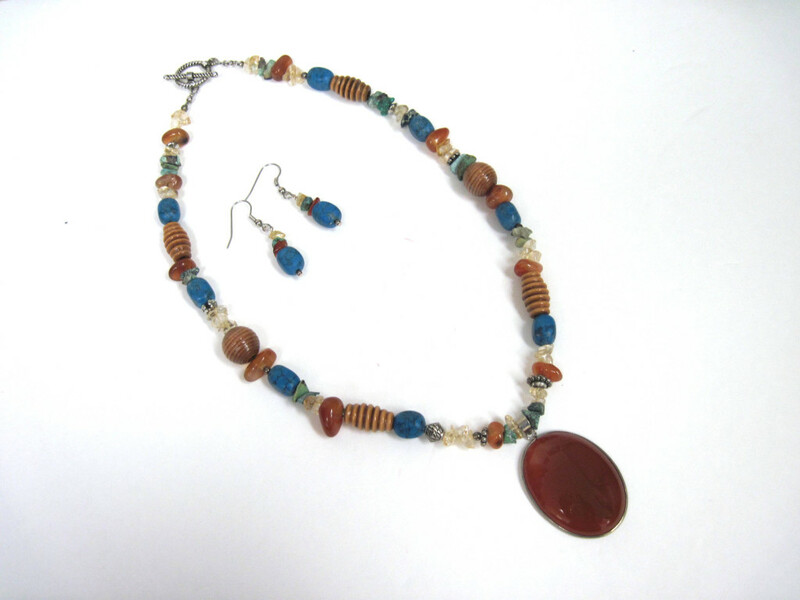 Measures 20″ for necklace, additional 2″ for drop. Green Aventurine is considered a stone of luck. All green stones are used for healing, green aventurine is especially to help the heart since it is a heart chakra stone. It bestows vitality, growth and confidence. This is a beautiful, timeless piece of jewelry designed and created by Dee. 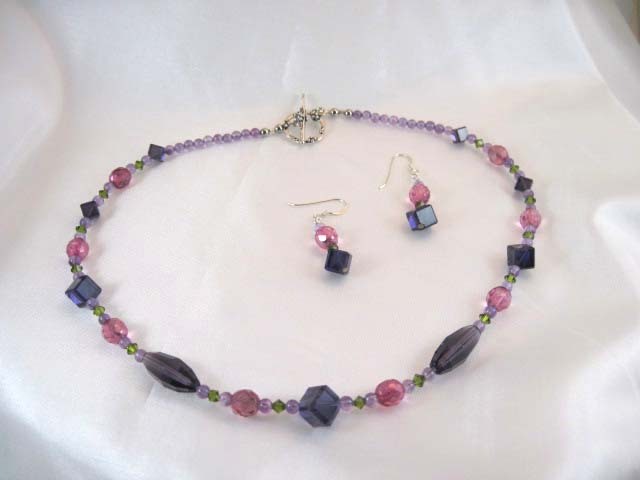 Just in time for Spring, this 16″ necklace features purple focal glass beads, green Swarovski crystal, faceted fuchsia beads and amethyst beads. Sterling Silver clasp. Tiger Eye natural stone Necklace 19 inches, with dyed natural agate drop that adds another 2 1/2 inches. 3 inch detachable extension. This crystal druzy Pendant is dyed stone with small crystals exposed that looks and feels like Onyx. 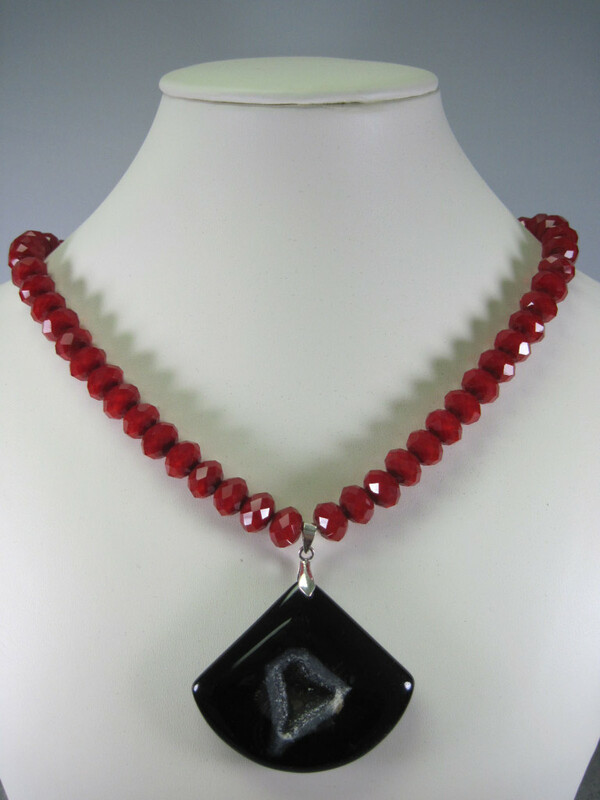 It is a one of a kind, and Dee has featured it on beautiful red velvet like glass beads. It is stunning and a timeless piece that can be worn when dressing up or for a more casual dramatic look. Necklace is 17 inches and the drop adds an additional 2 inches. It come with a 3 in extension attached to lengthen the look. 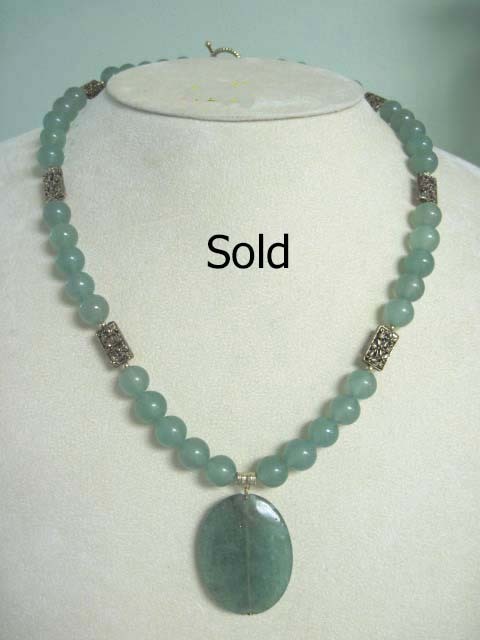 This necklace is made from Aventurine Beads and has a oval Aventurine drop. It looks very much like more expensive Jade. Green Aventurine is considered a stone of luck. All green stones are used for healing, green aventurine is especially to help the heart since it is a heart chakra stone. It bestows vitality, growth and confidence. This is a beautiful, timeless piece of jewelry designed and created by Dee.